We guide public-private collaboration to get big things done. Together, we accomplish more than any sector can on its own. As a big city, Chicago is unique—open, welcoming and committed to community, with a long tradition of private and public sectors working together. That’s what Civic Consulting Alliance is all about. 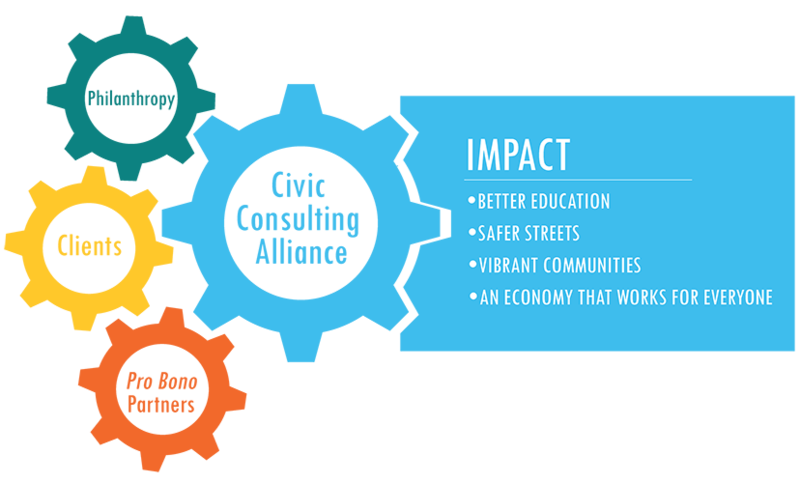 Civic Consulting Alliance is the engine of public-private sector collaboration. We do our work in concert with talent from the most respected companies in the region, pro bono, and together we drive impact that no single entity can accomplish alone. Our clients are public sector leaders such as the Mayor, Cook County President, Cook County Health and Hospitals System CEO and others. Together we develop and execute projects that leverage public sector vision and private sector expertise to solve our region's biggest problems. Our mission is to make the Chicago region a great place for everyone to live in and work. By leveraging the support of the Civic Committee of the Commercial Club of Chicago (collectively the major private employers in the region) with incomparable professional resources and committed leaders, CCA provides consulting services to clients to help address the region’s most pressing problems and greatest opportunities in four areas: Education; Criminal Justice and Public Safety; Economic Vitality; and inclusive Civic Leadership. Through all of our values we commit to creating a vibrant organization in which people from many backgrounds experience a sense of belonging, have the opportunity to be heard, and contribute and excel in driving equity in our region. We bring together partners from the public, private and non-profit sectors to invest in solving the most challenging issues facing our region. We select projects carefully, ensuring resources are devoted to areas where they can make the greatest impact. At CCA, collaboration means we value our diverse professional talent. We treat each other with respect and appreciate the uniqueness of each individual. We work to listen and understand our colleagues’ perspective to embrace different identities and experiences. Using our cross-sector relationships, longitudinal knowledge of public sector issues and private sector management skills, we drive practical solutions and measurable results that would not be possible without our involvement. At CCA, impact means we harness diversity of thought. We ask each other critical questions and provide suggestions to advance our thinking and maximize impact. We proactively reach out to our colleagues and external stakeholders to benefit from broad perspectives. We are curious, courageous and independent, daring to take on the region’s toughest problems and persevering until we meet our goals. Through our work, we develop future civic leaders from among our team, our pro bono partners and our client organizations. At CCA, leadership means we empower initiative taking. Everyone is supported and responsible to make CCA the place he or she wants it to be. We all contribute to the success of our Firm and our colleagues. We maintain a big picture perspective to help our clients stay focused on the key long term issues despite day to day challenges. We honor our clients’ confidentiality and hold ourselves to the highest standards of integrity. At CCA, sound judgement means we use impact as our measure to achieve balance. We prioritize and actively manage our collective and individual work loads through a lens of impact, both to drive positive change for the region and to efficiently manage our internal operations. We set and achieve ambitious goals for our clients, our partners and ourselves. We hire and partner with the most talented individuals and firms in pursuit of those goals. We bring simplicity and clarity to solve complex and ambiguous problems. At CCA, excellence means we accelerate our development. We take on stretch roles and actively provide feedback and coaching to support each other through them. We encourage risk taking that drives innovation for our Firm and personal growth. The unique Civic Consulting Alliance model began with a single request from Mayor Harold Washington in 1985. But we trace our roots to the formation of the Commercial Club of Chicago more than a century ago.